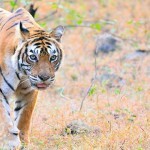 Bandhavgarh National Park is the most visually stunning in the month of October. For this, it is on top of our list of national parks to visit in October. The unbearable heat of June-July and monsoon season in August-September has passed by. Your trip to Bandhavgarh National Park in October will be comfortable as the weather is very pleasant and you will not be tired at the end of the day. Wildlife safaris will start from 16 October in the morning and evening. Head to Ranthambore National Park and make the most of your exclusive October visit. The plentiful water holes indicate that last month belonged to heavy rainfall, but now the weather is pleasant and rain has helped the flora to nourish and sprawl. You can enjoy animal activities through jeep safari. The park opens on the first of October for tourists. Tigress Machli, one of the recently born cubs of Krishna, and Sultan will be the major attractions in Ranthambore National Park. 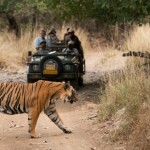 An ideal place for spotting wild tigers, Ranthambore National Park should be your pick for this wildlife season. 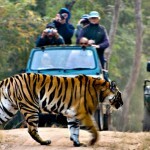 Corbett National Park has enjoyed its monsoon break, and is now a heaven for wildlife fanatics. Wild animals are now out for hunting and bathing in the sun. Pack your bags to make the most of the abundant wildlife and world class recreational opportunities at Corbett National Park. Located in the foothills of the Himalaya, Jim Corbett Park will open on October 15. Known for its rich marine flora, Marine National Park is the first marine park in India. Pleasant weather of October is ideal for a visit to Marine National Park as it can be unbearably hot in summers. Established in 1986, Marine National Park has an archipelago of 42 islands with Pirotan, Narara, and Karubhar as major islands. Colorful coral reefs, mudflats, mangrove swamp forests, sea grass, saag, and sea weeds form the landscape of the shallow waters of the Marine National Park. This park will open on 15th October. A combination of several factors invites you to visit Blackbuck National Park as it re-opens on October 15. Known for its population of blackbucks and wolves, Blackbuck National Park is at its best after the heat of the summer and monsoon rains. An evening in the month of October is the best time to watch the Blackbucks and other fauna. Known for the successful conservation of Blackbucks and Florican, Blackbuck National Park was established in 1976. After the brutal summer heat and inundation in monsoon, Hazaribagh National Park is surprisingly beautiful and vibrant in October. Adorned with charming beauties, Hazaribagh National Park has a decent population of tigers, panthers, spotted deers, bisons and other mammalian fauna. Pack your bags, and head to this national park to watch the wildlife in action with morning and evening safaris. The park will open on 1st October for tourists. Summer heat and monsoon rains are a thing of the past as October is approaching. Jaldapara National Park has the second highest population of one horned rhinoceros after Kaziranga National Park in Assam. A paradise for bird watchers, Jaldapara National Park opens on 15 September. Moreover, an extended weekend in October indicates that it is the right time to pack your bags to enjoy the wildlife and scenic beauty of Jaldapara National Park. This large national park comes alive with wildlife in the month of October. Established with an aim to conserve the beautiful Sangai deer, Keibul Lam Jao National Park is at its visual best after the regular showers in the months of August and September. The national park is a combination of beautiful aquatic, wetland and terrestrial ecosystem. The weather is quiet pleasant in the month of October and you can see the amazing wildlife of the park in morning and evening time with wildlife safaris. Keibul Lam Jao National Park opens on October 1. As October approaches, roads are washed, repaired, and are restored to motorable condition again. Last month was dominated by heavy rains, but now flora and fauna of the national park has flourished. You will find animals drinking water from the eroded water bodies when you will visit this national park in October. The last remaining home of red pandas, Nokrek National Park was listed as a UNESCO Biosphere Reserve. Also a safe habitat for Asian elephants, Nokrek National Park is one of the best national parks for an October vacation as the park opens on October 1 for tourists. Although the climate in Bandipur National Park is moderate throughout the year, October is the month which travelers prefer for sighting the wildlife of Bandipur National Park. 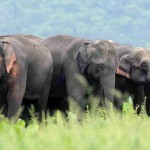 Having the largest population of wild elephants, Bandipur National Park is high on the list to be visited in October. Rains have thinned by October, and the refreshing nature adds brilliance to the beauty of the national park. This national park comes alive in the month of October as elephants, gaurs, sambars, chital come out to feel the fresh weather. Although flora and fauna of Nagarhole National Park are awe-inspiring throughout the year; it is great fun to explore the park in October when the temperature is just perfect for wildlife outing. A beautiful lake, rich wildlife and lush green jungle are what await you at Nagarhole National Park. The temperature starts dropping in October in Karnataka, summer crowd gets thinned, and an extended weekend in October is a plus. With 2 October being a national holiday and Dussehra on 3 October, the stage is all set for an adventurous holiday. Call your buddies and plan a perfect tour to a national park to experience the excitement of the jungle with pleasant weather conditions on your side. More and more people will be visiting these national parks, so get your tickets and accommodation booked in advance to enjoy a hassle free vacation.